t was quite a while before you and I were born that a boy by the name of George Peabody lived in Danvers, Massachusetts. He had such good lessons in school that his teachers rather thought he would go to college, but one day he took his books out of his desk and said he must leave school and go to work, because his mother was very poor. The teacher said: "We shall miss you, George, and hope you will have much good luck!" George was only eleven when this happened. He was a round-faced, plucky, little fellow, with the good manners that generally go with a kind heart, and there wasn't a lazy bone in his body. Mr. Proctor, the grocer, thought he was just the kind of a boy he needed in his store. So he hired him. 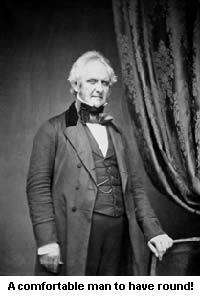 Right away the housekeepers in Danvers agreed that George Peabody was the nicest grocer-boy they ever saw. They said to each other it was worth the walk to the store to have him hand out their packages with his sunny smile, his pleasant words, and polite bow. When he carried the heavier things, like a bag of meal, or a gallon of molasses home for them, they would coax him to rest awhile and eat some fruit or cake. They all liked to talk with him. George stayed with Mr. Proctor four years. Then he went to Vermont to help his grandfather. Mr. Proctor almost cried when he saw the big stage-coach rattle away in a cloud of dust, while the boy who had been so faithful to his duties waved good-by with his handkerchief as long as he could see. When George was sixteen, he joined his brother David, who had a store in Newburyport. The young people in this old sea-port town made friends with him at once. They asked him to every fishing-party and picnic they had, but he was usually too busy to go, for besides selling goods all day, he often wrote cards in a clear, neat hand, in his room evenings. He spent almost nothing on himself, but was as happy as could be when his letters to his mother held more money than usual. His being poor did not matter. The rich boys in Newburyport were glad to pay his share in games and excursions any time he could take a holiday, just for the sake of having his lively company. A fire destroyed David's store, and George had to make a fresh start in Georgetown. It was the same story there. It was no time at all before the mayor of Georgetown said to the doctor and the minister: "I tell you, George Peabody is a comfortable person to have round!" At twenty George did not have a dollar of his own, but after the fire plenty of men offered to lend him money, and he kept on working in his happy way until he was thirty-five, when he found himself rich enough to go to London and not only have stores but to open a bank, too. Then Englishmen began to find out what a comfortable man George Peabody was to have round. He had no wife and lived rather simply himself, but was glad to spend a great deal on other folks. He found the working men lived in filthy, unhealthy places, so he built a great square--almost a little village--of neat, pretty, working men's homes. (In his will he left the poor of London half a million dollars.) Then, when it was feared that Sir John Franklin, the great arctic explorer, was lost, and there was need to send men to search for him, George Peabody said: "Let me help--I'll fit out a ship," and he paid for everything that went aboard the Advance. You understand, now, why you find on the geography maps a point, way up north, called Peabody's Land! The Englishmen took a strong liking to this sociable American who had settled among them, and it was thought a great treat to go round to his rooms in the evening and have a game of backgammon or whist after a jolly dinner, at which Mr. Peabody always told funny stories. He had a fine memory and a real gift for story-telling. He loved music and was delighted when people would sing Scotch songs for him. Living in England many years did not make Mr. Peabody love America any the less. When the great Crystal Palace was built in which to hold a sort of World's Fair, there were to be shown samples of things made by different countries. The papers were full of talk about this grand affair. One morning Mr. Peabody opened his paper at the breakfast table and read an article which ridiculed the looks of the rooms or stalls set apart for American products. I tell you it did not take him long to eat his breakfast. He said: "I guess I'll see about this. I guess my own country is not going to be made fun of!" He did not abuse the man who wrote the article, but he went right to the Crystal Palace to find out how our things did look. He knew the minute he got there that our agents did not have money enough to work with. So he just opened his purse and wrote letters and offered advice, until in the end the American stalls were decorated in exquisite taste, and when there were such things shown as Powers's "Greek Slave" (a wonderful statue), the very useful reaping machine of McCormack's, Colt's revolvers, and the printing press of Hoe, with many other interesting things, the visitors to the fair agreed that few countries had more to their credit than America. Then the English papers behaved very handsomely and spoke so well of our exhibit that I expect if George Peabody read the last article at his breakfast table, he may have chuckled to himself and said: "I'll risk America every time!" He noticed, while at the fair, how well the Crystal Palace was suited for large gatherings (it is mostly of iron and glass--with two immense, glittering towers) and decided he would give a big dinner on the Fourth of July to all the Americans in London. This dinner proved a grand affair. The Duke of Wellington and many famous English people were present. It was such a success that ever after, as long as he lived, George Peabody gave a Fourth of July dinner in Crystal Palace. Queen Victoria so deeply esteemed Mr. Peabody that she sent a message to him that she wished to make him a baronet, and confer the Order of the Bath upon him. And what word do you suppose he sent back? Why, he said: "I am going over to America pretty soon to visit the town where I was born, and as I do not care one bit about titles and such things, but do value your interest and friendship, I wish you would just write me a letter which I may read to my friends in America, who love you as I do!" The queen wrote a long, affectionate letter to him, saying what a blessing he had been to England, and asked him to accept her portrait. So when Danvers, a part of which had been set off into a new town by itself and named Peabody (for the faithful grocer boy, who had become the rich banker) was to have its hundredth birthday, George Peabody crossed the ocean to be there. He gave to his native town a free library and lecture hall and the portrait of Queen Victoria. This miniature was so set with gold and jewels as to cost fifty thousand dollars! The queen's letter is kept there to this day. Mr. Peabody gave money for museums at Yale and Harvard, an Academy of Science at Salem, a memorial church at Georgetown, the birthplace of his mother, and large sums of money for schools in the South, because he realized that after the Civil War there would be much disorder and poverty. Some men could not have kept perfectly friendly with two countries, but Mr. Peabody loved both England and America and in all he did and said tried to bind the two nations together. The very last time he spoke in public was at the National Peace Jubilee in Boston. When George Peabody died, the queen wanted him buried in Westminster Abbey, and when she found he had left a request to be taken to America, she sent a ship, the Monarch, across the Atlantic Ocean with his body. A good many lives and stories have been written about George Peabody, and he has earned several names like The Great Philanthropist--The Merchant Prince--the Ambassador of Peace--the Friend of the Poor--and so forth, but none fit him any better than the saying: "He was a comfortable man to have round!"